Music I loved in high school that helped me grow up into a person! Wildly beloved tapes: the Violent Femmes, a Smiths tape with The Queen is Dead and Meat is Murder that my oldest friend made me, They Might Be Giants. 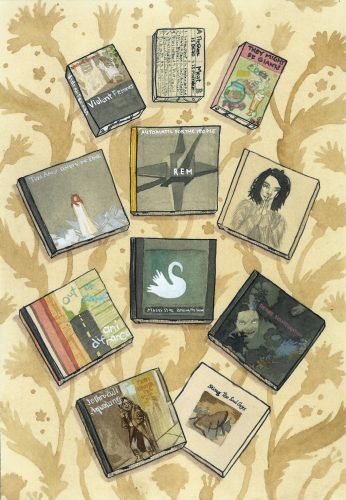 CDs: Tori Amos, Under the Pink; REM, Automatic for the People; Bjork, Debut; Ani Difranco, Out of Range; Mazzy Star, Among My Swan; the Cure, Disintegration; Jethro Tull, Aqualung; and Sting, the Soul Cages. I also listened to lots of Beatles (Sgt. Pepper, the white album, and the Magical Mystery Tour) and the Police (Ghost in the Machine, Synchronicity), but ran out of room.